banjo pot is always a challenge but also very satisfying when the project is done. 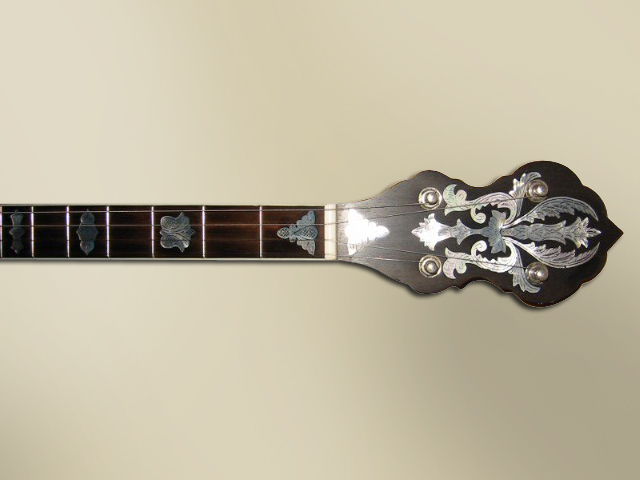 The complexity varies from the less decorative three piece laminated neck, star and dots type inlay, and bound neck to the more decorative 3-5 piece laminated neck, extra laminated wood marquetry, complex inlay, back strapping, and fancy heel caps. Each vintage reproduction neck project has a one-of-kind neck feel that is fun to make. When available, I use pre-cut inlay patterns cut by full time pearl cutters. When a requested inlay pattern is not readily available, I will cut the pearl myself. I will do heel carvings to replicate existing designs. neck would generally start around the $500 range with any required hardware such as tuners, tail piece, dowel stick brace, etc would be extra. For the more decorative reproduction neck, the price would be determined based on the requested enhancements. Lead time for the reproduction necks runs in the 3-4 month duration depending on the amount of requested decorations requested. The total lead time is determined by the amount of work in process.